A few weeks ago I wrote about how you’re not too busy for music. “I have an 8 month-old daughter and for the first several months, I fell into the, ‘well, I just have no free time’ camp. All progress on my musical hobbies (and all hobbies in general) completely stopped. “Suggestion: you COULD pull off a recording session. Here’s how: before you go to bed one night, take 5-10 minutes to set up the mic, headphones, etc. and anything else you need, create tracks in your DAW, etc. Then when you have 30 minutes the next morning, sit down and bang out a few takes. If it’s a 4-minute song, you could easily get 2-3 takes in a half hour. A few days later, David emailed me. At 6:04 am he was in his studio, getting stuff done. He made use of the full 45 minutes he had to work on a song. He said it was awesome to be able to keep the momentum and creativity flowing from one day to the next. David is (in my opinion) a rock star. He’s not letting excuses keep him from pursuing music. And he’s also not neglecting his family or responsibilities. He found that happy medium, where he can work on music almost every day. You don’t need 4-hour blocks of time to get anything done in your studio. Longer sessions are great, but in between them find those hidden opportunities in your schedule to get in the studio and make something happen. 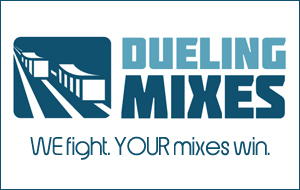 Maybe your first session could involve simply setting up a mix session for this month’s song over at Dueling Mixes.